Applying TV Hunting Terms to the New England Hunter - the4pointer.com | Real Hunts. Unreal Stories. With the onslaught of Hunting Shows and endless hunting related info available on the World Wide Web, I have recognized that there is a void that needs to be filled in New England where the hunting conditions are a bit more difficult. The problem is that most of the shows pertain to the Midwest or West regions of the country where hunters literally get to sift through trail camera photos to choose the buck they want to hunt. Along the way they pass up the 120” and 130” bucks, and even larger in some cases as they hold out for “The Big One”. If you read my post last week you know that The Big One I spend my time chasing is more often a mythical beast that beds down in the predawn darkness by rappelling down an old mine shaft five ridges to east and doesn’t emerge until 11 p.m. One day we will cross paths but it won’t be because I intercepted him from his “sanctuary” on the east side of the property that no one is allowed to enter while he is en route to THE food source on the west side of the property. Nope. It will be because I flipped a coin before I left the truck to decide if I should hunt the area where we have four pictures of a buck over the previous three years or hunt the side of the hill where there are some deer tracks but the wind is always wrong. The coin will tell me to hunt the area where we have the pictures but I’ll go with my gut and hunt the other option. (Always go with your gut.) A buck will do the same thing when he decides to choose his bedding spot for the day, our paths will cross, and BAM!-I’ll have my buck. That’s how I’ll connect with The Big One. However, this is not an article intended to be a how-to on whining about tough hunting conditions. This article is intended to redefine common phrases and terminology heard on hunting shows so we New England hunters can use them too. Words like “Encounter” and phrases like “We’ve hunted so hard over the past three days” mean something entirely different to your average TV hunter who’s “Harvesting” (i.e. killing) bucks in a deer infested area so they can produce for their show than it does to a hunter in this neck of the woods. Here are five that you can use the next time you speak with your hunting buddy. “I had an encounter with a sapling rubbed by a buck last year in an area where he once stood on his way back to the mine shaft for the day. 2. Management – Most of the TV and Internet advice in this category is centered on large pieces of property governed by like minded individuals pursuing the dream of raising up The Big One, letting him grow until he is at the peak of his genetic makeup, and then “harvesting” (i.e. –killing him) before he begins his decline and is no longer valued. This is done in a number of ways. First, define the sanctuaries where the big bucks can safely hide out every day. Second, plant screenings to allow undetected access into and out of your stand site. Third, create funnels to direct the deer by your stand. Well, Duh! Let’s see how you can apply that to this region. It’s important to understand one key point before exploring the alternatives to action points 1,2, and 3 listed above. Let me explain. I sometimes hunt a piece of woods closer to my house. It isn’t big by any means, maybe 100 acres, but there are deer on it. Wouldn’t you know it there are also other hunters, but they are not like-minded. So there goes the option of raising up The Big One until he reaches his peak. So what is a hunter to do? I suggest coming to the realization that you don’t live in the Midwest. Once you accept that reality you can work on alternative management strategies. First, define the sanctuary on the piece of property. The sanctuary is usually the area that a big buck can safely bed down for the day. On a much larger piece of woods I hunt this is done by taking out the map and circling the entire area. Viola! Sanctuary defined! The property is dotted with steep elevation gains, rocky ledges, and dense thickets. Rarely do the bucks consistently bed in the same area. Rather, they walk until they are tired or done feeding and lay down. So by default the entire area is the bedding area. It makes it tricky to hunt. Second, plant Screenings to allow undetected access to your hunting area. Around here this was done at the dawn of creation and has been logged thirty seven times since. What exists now is the screening the Midwesterners talk about and they are called trees. Just call the trees “Screening”. It sounds cooler. Third, create funnels to direct the deer past your stand. In Vermont there are a lot of natural funnels and some unnatural ones. If you happen to hunt in a somewhat suburban area where there are more deer just refer to the surrounding houses as the natural funnels. If you hunt in the less populated areas just convince yourself there are funnels or cut down a row of trees 300 yards long and leave the brush. Refer to this as “the funnel”. 3. 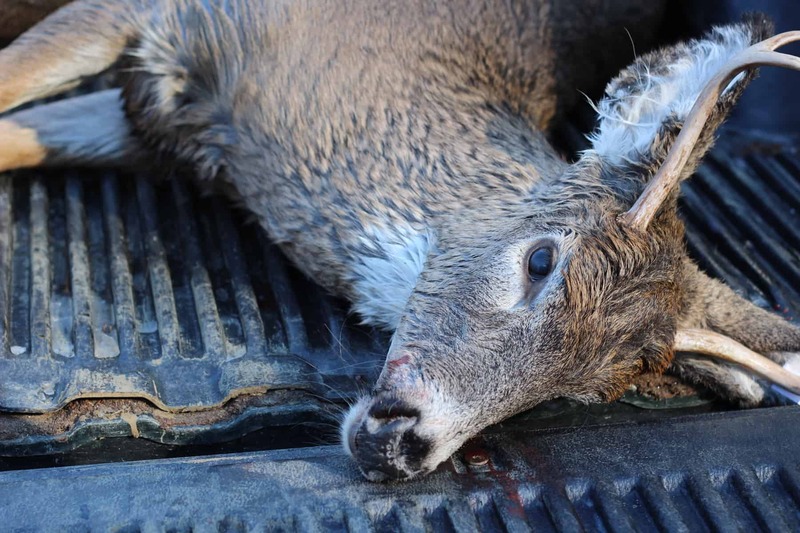 Management Buck – A management buck is defined by his lack of genetic potential. He is typically a mature (pronounced ma-tour) buck whose antlers will never get any bigger. He needs to be removed from the gene pool so he doesn’t continue to spread his stuff. Management bucks become dominant and the problem is that that even though his antlers may not be very big he will still win breeding rights and push the younger, genetically superior bucks away from the does. He needs to be harvested (i.e.-killed). Great TV hunters kill management deer every year and they make a point to explain to the viewers what they have done and their selfless act of using their tag on an inferior buck will also gain them respect amongst their peers. After all, harvesting (i.e.-killing) a 140” 8 point is a true sacrifice when there are 170” deer running around and it proves they are good hunters and managers who care about the health of the herd. Around here a management buck is defined by his ride in the bed of a pickup truck. The state has set management goals for each hunting season so by default every buck that is shot is a management buck. This is actually pretty sweet because if you ever find yourself talking to a hunter from the Midwest you can tell them you shoot management bucks all the time. Your stock as a hunter will increase dramatically and you will suddenly be respected. Last year I shot a management buck and although I didn’t have the chance to talk to a mid-westerner I did have the opportunity to explain the process to my 2 year old. I stood there, leaning against the truck bed where my young four-point buck lay dead and explained to him all the important aspects of taking a management buck. He was clearly impressed and exclaimed “Yucky deer!” and the conversation ended. It was good practice, though, and if you can find a two year old to practice on I highly advise it. 4. “We’ve hunted so hard.” My favorite hunting videos are the Monster Bucks series produced by Realtree. These movies are high quality and provide hours of entertainment. One thing I have noticed in these videos is that the phrase “we’ve hunted so hard” is used quite often. The most recent articulation of this phrase came from a hunter who had put in three “long” days during the warm early bow season in northeast Wyoming. On the third evening of the hunt he arrowed a velvet-racked 10 point after watching a parade of deer move by his stand in the late summer warmth. In his adrenaline fueled interview following the harvest (i.e.-kill) he exclaimed “We’ve hunted so hard these past three days!” I’m not downplaying his accomplishment but I will respectfully disagree with him on the meaning of the phrase. This phrase should never be used by a New England hunter after three pleasant evenings in the stand watching 100 deer. It should only be used if two things occur. First, there needs to be physical discomfort. This can come in the form of fatigue, frostbite, blisters, or hunger and can only occur during the late fall after weeks of pursuit. Second, there needs to be mental discomfort. Again, this usually occurs in the late season after minimal deer sightings and repeated failures to see The Big One during daylight hours. It manifests itself through anger, frustration, disillusionment, surrender, failure, etc. You can detect this in others by watching the expression on their face while they check trail cameras or listening for the boredom induced gun shots echoing down the valley during the noon hour. You can detect this occurring in your own mind when thoughts of snuggling under a warm blanket and watching some guy on TV hunt hard for three days starts to sound better than sitting on a cold rock. 5. “Harvest” – The term harvest is the hunting equivalent of a political correct term. It means “to kill”. There is not really any reason to redefine this term for the New England hunter, but I suggest a movement be started to end the use of the word in the hunting arena – in any region of the country. In my opinion, New England is the toughest place in the country to hunt whitetails. So, if you are going to hunt here you might as well have a little fun doing it. Enjoy the hunt! Nice article Tim. And very informative. I suggest that this be only a first chapter in a valuable “hunter’s glossary”. Other terms/phrases that might need attention are: “what’s that noise?”, “How do I pee in a tree stand?”,”How far away was he when you shot him?”,”Which deer lure is best?”, “You have to have the best optics”, “we have a lot of work to do now”, “Hey look there he is, what a surprise”, and many others. I will be looking forward to more vocabulary edjikashun in the future.